Wallace Stevens needs to be read in isolation. His poetry makes little sense in conjunction with anyone else's. Like many people, I was baffled when I first read his poems in high-school anthologies: "The Emperor of Ice-Cream" sounded like antique mumbo jumbo in comparison with the up-to-the-minute adolescent angst of "The Love Song of J. Alfred Prufrock." Only when I began to read the 1954 Collected Poems of Wallace Stevens did I come to terms with him. Stevens eludes the anthologists because no one poem is the great one. It's the total book that counts. You can pick up the new Library of America edition of Stevens' Collected Poetry and Prose, turn to any page, and sink yourself into the unconditional, unfootnotable splendor of the voice. I am not sure if this edition is the ideal packaging of Stevens, even though it includes more of his work than any previous collection did. It may include too much — the words look smaller, the margins thinner. For a writer as worshipful of words as Stevens, these slight differences matter. Stevens' rough chronological equivalence with Joyce and Eliot has created a mistaken notion that his poems are rich in complexity. Blessedly, they are not. Stevens offers a double liberation: first from meaning, then from modernist meaninglessness. His world is separate, immaculate. You do not need a Dublin map or a German phrase book to travel in it. Academic interpreters have failed to meet the challenge posed by Helen Vendler in her landmark study On Extended Wings — to give up the search for intellectual subject matter and to treat Stevens as "pure sound." Vendler herself sometimes fails to meet that standard. She offers ingenious paraphrases and elaborations, but she imposes a false order on a genially chaotic world. She looks for process and argument in a poet who excels at sudden revelations in miniature. She and others have also promoted the idea that the greatest Stevens is to be found in his ambitious long poems. But it is in those poems — "Notes Toward a Supreme Fiction" and "An Ordinary Evening in New Haven" — that his language is driest, his images dullest. Stevens came closer to the Supreme Fiction in short forms, in fragments. Of what it sees, for all the ill it sees? But the dark italics it could not propound. Merely in living as and where we live. Twenty-seven monosyllables in a row, then twenty-one. Twelve polysyllables among eighty-six words. This has to be some sort of record in the English language. Back to "The Idea of Order," which culminates in another highly monosyllabic line: "And when she sang, the sea,/ Whatever self it had, became the self/ that was her song, for she was the maker." But as the language grows ever more chiseled and incisive, the picture grows more vague. That woman singing on the beach is dissolving into abstraction. It seems as though some principle is being preached. At this point, if you read the poem in high school or college, you may remember deadly questions intruding from the poetry anthologies: "Does the sea represent language? Is the woman the poet?" Any question about meaning in Stevens, whether well or badly formed, ruins the trance. His words are a dream melody of language, bells from nowhere. You can hear as much in tapes of Stevens reading aloud; he is so intent on keeping an even, magisterial tone that he occasionally loses himself in the convoluted syntax on which Vendler expends such analytic energy. Stevens fashioned a new oratory free of meaning; he wrote a surreal, agnostic King James Bible culled from dilettante philosophy, dated chinoiserie, and picture-postcard Americana. Stevens' grandeur is an inch away from absurdity, if not in the thick of it. This is by intention. He liked to deflate solemnity with silliness. His humor is his least noticed attribute, probably because it is so widespread. Even his titles — "The Revolutionists Stop for Orangeade," "The Emperor of Ice-Cream" — undercut their own pomposity. Sometimes I think Stevens was a collegiate prankster who never gave away the joke he played on literature. He comes close in some of the offbeat writings that appear toward the end of the Library of America edition--especially in such nonsense aphorisms as "A poem is a cafe," "A poem is a pheasant," and "All men are murderers." More than a few of the poems, I think, are self-parodies, although it's hard to say which. (A good candidate is "Of Hartford in a Purple Light": "A long time you have been making the trip/ From Havre to Hartford, Master Soleil,/ Bringing the lights of Norway and all that.") Stevens, securely employed for much of his adult life by the Hartford Accident and Indemnity Co., could afford to laugh aloud at the pretensions of the poetry business. The day to pieces and cry stanza my stone? Yes it is; this is what poetry is. But Stevens frames his manifesto in questions, as if uncertain. I think he's pointing up a contradiction. The poetry that he imagines being murmured on the dump — "aptest eve," "invisible priest," "stanza my stone" — is not in itself distinguished; by intention, it's a bit ridiculous. The sublimity comes in the way those fragments of a Romantic vision glide together with artifacts of ordinariness--bottles, pots, shoes, grass. The poem performs its theme; it is self-sufficient, it runs on its own power. It is the purity of Stevens' language that makes the Library of America edition — edited by Frank Kermode and Joan Richardso — seem a bit "off." Not only do the poems look better in the Collected Poems (which, to be sure, omits great ones early and late); they are also unencumbered by comparison with the "uncollected poems," which include a lot of mystifying mediocrity. It's good to have all the poems in one place, and also the published prose and a smattering of letters. But it's also distracting and, occasionally, misleading. You can't find the real Stevens voice in the early poems, but you can find it in early letters not printed here. In one, the teen-age Stevens writes a dead-on Stevensian description of a motley village band — "the piping of flamboyant flutes, the wriggling of shrieking fifes with rasping dagger-voices, the sighing of bass-viols, drums that beat and rattle, the crescendo of cracked trombones." Eight years later, the young man writes flamboyantly to his fiancee, "I believe that with a bucket of sand and a wishing lamp I could create a world in half a second that would make this one look like a hunk of mud." For all its omissions, Collected Poems is the better picture of that awesome world. Original publication: Alex Ross, "The Emperor of Ice Cream," Slate, Jan. 8, 1998. 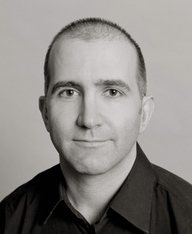 Alex Ross has been the music critic of The New Yorker since 1996. His first book, The Rest Is Noise: Listening to the Twentieth Century, won a National Book Critics Circle Award and the Guardian First Book Award, and was a finalist for the Pulitzer Prize. His second book is the essay collection Listen to This. He is now at work on Wagnerism: Art in the Shadow of Music. Ross has received an Arts and Letters Award from the American Academy of Arts and Letters, the Belmont Prize in Germany, a Guggenheim Fellowship, and a MacArthur Fellowship. Contact: Alex Ross, The New Yorker, 1 World Trade Center, NY NY 10007. Agent: Tina Bennett, WMA. Lecture agent: Bruce Miller, Washington Square Arts, bmiller [at] wsfilms.com (for speaking engagements only). The New Yorker, December 2, 2002. A few years ago, a man who faced a terminal diagnosis of cancer asked a friend to give him some compact disks so that he could have a little music to help him get through the night. Among the recordings that the friend sent was "Tabula Rasa," on the ECM label, which contained three works by the Estonian composer Arvo Pärt. A day or two later, the man called to thank his friend for the disks, and, especially, for the Pärt. In the last weeks of his life, he listened to practically nothing else. Several people have told me essentially this same story about the still, sad music of Pärt—how it became, for them or for others, a vehicle of solace. One or two such anecdotes seem sentimental; a series of them begins to suggest a slightly uncanny phenomenon. Patrick Giles, in an article for Salon, reported that when he worked as a volunteer for an AIDS organization, in the nineteen-eighties, he played "Tabula Rasa" for those facing the final onslaught of the disease, and they developed a peculiar, almost desperate attachment to it. Once, when Giles was away, the mother of one of the dying men called with an anxious query. "He keeps asking for 'angel music,' " she said. "What the hell is that?" The music in question was the second movement of "Tabula Rasa," in which a rustling arpeggio on a prepared piano leads into glacial chords of D minor. According to the unsentimental evidence of record sales, Pärt's music reaches far beyond the conspiracy of connoisseurs who support most new classical music. He is a composer who speaks in hauntingly clear, familiar tones, yet he does not duplicate the music of the past. He has put his finger on something that is almost impossible to put into words—something to do with the power of music to obliterate the rigidities of space and time. One after the other, his chords silence the noise of the self, binding the mind to an eternal present. For this reason, anecdotes of listeners' experiences, whether extreme or mundane, may give a better account of the music than any analysis of its inner workings. For me, "Tabula Rasa" will always be a snowy New England afternoon in 1989, during which there was nothing in the world but this music and that snow. Earlier this month, a festival called Music Around presented twenty-two of Pärt's works in various Scandinavian cities. The composer travelled from his home in Berlin to observe the event, settling into a hotel in Copenhagen. I talked to him there, in a smattering of English and German, at the hotel's restaurant. Pärt is a gaunt man with a pale, gentle face and mournfully powerful eyes. His bald pate is balanced by a tightly curled beard of a few inches' length. He has been described as "monkish" so often that a German musicologist has undertaken a deconstruction of the term, but the word still springs to mind unbidden: he could pose for an icon of St. John Chrysostom, or another of the literary saints. Yet, when his large eyes fix on you, he becomes more worldly and formidable; his stare seems to ask, "Are you serious?" At times, he is unexpectedly impish, even antic. He needs few words to make himself understood, using a repertory of quasi-operatic gestures and clownish faces. "My life is a river, and I am a boat being borne along the current," he told me. "I cannot relate to my life as a story, as a sequence of events, because I cannot get off the boat in order to see where I am. I do not see myself as moving forward or going backward." I asked him whether he believed in musical progress, in the idea of an avant-garde. He vigorously shook his head. "I do not know what this word 'progress' means, at least in the area of art. Progress in science can certainly be measured and described. But to talk about a particular style or a particular work as progressive or regressive is arbitrary, totally misleading. It reminds me a little of Brueghel's painting of the blind leading the blind. One man is tumbling down, his staff held out like a spear or sword in front of him, and the others are following behind him. They are all making progress, and they are all falling down. The story is found in the Bible. How many painters this word 'progress' has made blind! How many composers this word has made deaf! And they carried behind them generations!" He looked stricken for a moment, as if he had just seen a horror out of Bosch. Pärt was born in 1935, in a small town in the Estonian countryside. According to Paul Hillier's study of the composer, he grew up playing an ancient grand piano that lacked a middle register, so that he made music only at extremes of high and low. He studied composition in the national conservatory, in Tallinn. He moved steadily through all the styles that were available to him, from neoclassicism to socialism and on to Western avant-garde techniques of serialism and chance. He even dipped into John Cage-ish happenings, once participating in a concert at which a violin somehow caught on fire. Finally, in 1976, he turned inward, discovering a new, radically simplified language. "Tabula Rasa" was one of the first products of this style, which came to be called "tintinnabuli," after the Latin word for bell. In its basic form, it involves the interweaving of two voices, one of which moves by melodic steps while the other rotates through the pitches of a major or a minor chord. The method has something in common with the early minimalist pieces of Steve Reich, but the resemblance is better explained by the fact that both composers drew on the same ancient sources: polyphonic composers of the late medieval and early Renaissance periods. The tintinnabuli works were also informed by an intense religiosity, flowing from Pärt's embrace of Russian Orthodoxy. This meditative strain contributed to his subsequent popularity in the nineteen-nineties, when records of Gregorian chant mysteriously showed up on the pop charts. But there was nothing fashionable about Pärt's choice of style back in the Estonian Soviet Socialist Republic. The composer had already established himself as something of a maverick; his 1968 work "Credo," in which a prayerful choral arrangement of Bach's Prelude in C Major sounds defiantly in the middle of musical chaos, drew official censure. By the late seventies, as Pärt began to acquire international fame, he found that he was not permitted to travel freely abroad, and that his works were being taken off the market. In 1979, at a meeting of the Estonian Composers' Union, Pärt denounced official policy while wearing a longhaired wig. The following year, he was able to obtain an exit visa to Israel—his wife, Nora, is Jewish. Alfred Schnittke, who had played the prepared piano in the first Western performances of "Tabula Rasa," arranged for the Pärts to stay in Vienna, and they ended up settling in Berlin. Pärt said of his early, "wild" years, "I was writing music in which there were many notes thrown down on the page like so." He made a scattering gesture with his hands. "Notes were being strewn about like coins or jewels. I was not guarding these notes as treasures. I was not holding them, one after another, in my hands. Every note is decisive, every note is telling." Yet, for all his love of spare, repetitive textures, he does not treasure the minimalist label that has been attached to him. "Two composers, Philip Glass and Steve Reich, changed the world at that time," he said. "I have great respect for them. Still, I am not a minimalist. I understand that music critics will always find categories for my works and put them away in suitable drawers, but to call me a 'holy minimalist' sounds a bit ridiculous." He cupped his ear and listened to the hollow air. As Pärt and I talked, a pan-flute arrangement of the "Titanic" soundtrack was playing on the restaurant's loudspeakers. It played over and over, in an endless loop. Although Pärt asked the waitress to turn it down, it refused to go away. The juxtaposition was ironic, because this composer has sometimes been accused of writing background music—a higher Muzak for sensitive souls. His works have been used on movie soundtracks and in other suspect environments. The false association with New Age aesthetics has perhaps inadvertently been aided by the exquisite care that ECM takes in recording him. Since the mid-eighties, Manfred Eicher, ECM's longtime director and chief producer, has given Pärt's music a distinctive ambience, a sonic halo. Even the packaging of the disks, all crisp lines and monochromatic fields, is a beautiful exemplar of minimalist style. Recordings tell only half the story, however. They remain two-dimensional experiences, whereas Pärt is intensely concerned with the positioning of music in space. It was actively stunning to hear his works in the airy, chilly churches of Copenhagen, where the music seemed to crystallize out of the air and become an organic, multivalent thing. The Estonian Philharmonic Chamber Choir, under Tõnu Kaljuste, and the Latvian Radio Choir, under Kaspars Putnins, gave the music enormous immediacy: the voices buzzed against each other, then soared as one. Most commentators have overlooked the dramatic tension inherent in Pärt's work—the way an apparent state of equilibrium is undermined by one or two serpentine notes, or the way small harmonic shifts can turn into seismic shocks. When, in the choral work "Beatitudes," an intricately pivoting chain of modulations leads through twenty of the twenty-four major and minor chords, the effect is of a huge vista opening up from a narrow space. As happens so often, Pärt has found a precise musical image to explicate his chosen text: "Blessed are the poor in spirit, for theirs is the kingdom of Heaven." In recent years, Pärt has stretched his tintinnabulist idiom in order to accommodate a freer harmonic rhythm. He has set Latin, German, English, Spanish, and Old Slavonic texts, recalibrating his language to fit the demands of each. "Kanon Pokajanen," an eighty-minute-long setting of the Orthodox canon of repentance, mixes the rawness of folk ritual with the fastidiousness of theology. The English works, such as "Beatitudes" and "Litany," echo the soaring forms of Anglican hymns. "Como Cierva Sedienta," a Spanish-language setting of Psalms 42 and 43, has a strikingly vibrant, almost Fauvist orchestration and a richly ornamented vocal line; it is very nearly opulent. This recent work appears on ECM's latest Pärt disk, "Orient & Occident," which contains other intimations of new directions. The title piece, an elegy for strings, echoes the feverish intimacy of Benjamin Britten, whom Pärt reveres, while also forming unexpected links with Indian string writing and Arabic cantillation. The composer acknowledged his latest tendencies with a guilty smile. "Yes," he said. "I got a little crazy, didn't I?" He mimed a gesture that suggested a flamenco dancer throwing tennis balls. The wild Pärt of the Estonian years, who mocked the authorities and played the holy fool, is still lurking below the surface. The austerity of his present style may really serve to hold the other self in check; one wonders how much turbulence lies deep within these chapels of sound, which come close to Bachian perfection. Often, in the spiritual sphere, faith hovers at the brink of disorder and sorrow. At the end of our talk, I asked Pärt whether he felt lonely, both as a religious artist in a secular Western culture and as a classical composer in the kingdom of pop. He paused for a while, and the pan flutes filled the silence. "If loneliness brings bitterness and anger," he finally said, "then, I think, loneliness is a disease. We composers cannot brood, we cannot cultivate loneliness. Schubert, for example, never heard his symphonies in performance—they got no interest from publishers. But they are full of life. And his songs are nearer to Heaven than most music written for the church. He had the talent of love and the talent of compassion. Of course he was lonely, but his suffering gave out sweet nectar. "We cannot know all the good people in the world," he went on. "Not many of the good people are composers. Twenty years ago, my friend Valentin Silvestrov, one of the greatest composers of our time, said that nowadays great music isn't made in concert palaces. Instead, it is created in lofts, basements, and garages. Here you are, with your feet in lukewarm water, and the pan flutes are making noise—"
He stopped, frustrated at the inability of either English or German to bring his image to life. He took a pen out of his pocket and put it in front of me, as if that would explain everything. "Schubert's pen," he said, "was fifty per cent ink, fifty per cent tears." More on Arvo Pärt recordings. Back to Alex Ross: The Rest Is Noise. The New Yorker, March 22, 2004. "Louange à l'éternité de Jésus," live performance from the Banff Centre, May 24, 2007, with Matt Haimovitz, cello, and Frederic Chiu, piano. By kind permission of Banff. Recommended recording: Tashi. The most ethereally beautiful music of the twentieth century was first heard on a brutally cold January night in 1941, at the Stalag VIIIA prisoner-of-war camp, in Görlitz, Germany. 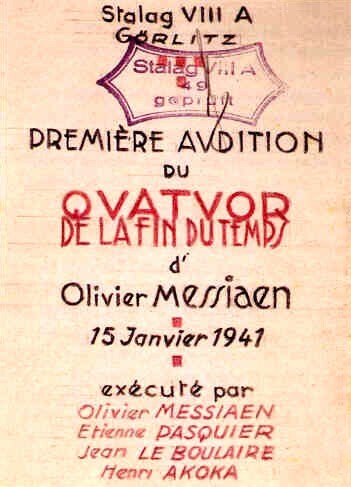 The composer was Olivier Messiaen, the work “Quartet for the End of Time.” Messiaen wrote most of it after being captured as a French soldier during the German invasion of 1940. The première took place in an unheated space in Barrack 27. A fellow-inmate drew up a program in Art Nouveau style, to which an official stamp was affixed: “Stalag VIIIA 49 geprüft [approved].” Sitting in the front row—and shivering along with the prisoners—were the German officers of the camp. The title does not exaggerate the ambitions of the piece. An inscription in the score supplies a catastrophic image from the Book of Revelation: “In homage to the Angel of the Apocalypse, who lifts his hand toward heaven, saying, ‘There shall be time no longer.’” It is, however, the gentlest apocalypse imaginable. The “seven trumpets” and other signs of doom aren’t roaring sound-masses, as in Berlioz’s Requiem or Mahler’s “Resurrection” Symphony, but fiercely elegant dances, whose rhythms swing along in intricate patterns without ever obeying a regular beat. In the midst of these Second Coming jam sessions are episodes of transfixing serenity—in particular, two “Louanges,” or songs of praise. Each has a drawn-out string melody over pulsing piano chords; each builds toward a luminous climax and then vanishes into silence. The first is marked “infinitely slow”; the second, “tender, ecstatic.” Beyond that, words fail. The clarinettist Rebecca Rischin has written a captivating book entitled “For the End of Time: The Story of the Messiaen Quartet.” Her research dispels several long-cherished myths about the 1941 première. As Messiaen told the story, he and three friends performed under the most trying circumstances—using dilapidated instruments, including a three-stringed cello—and won the hearts of five thousand hardened soldiers. In fact, the instruments, while inferior, were adequate to the task, and the crowd was more like three hundred. In Rischin’s telling, the Quartet is less a triumph of individual genius and more a collective creation. Messiaen wrote every note, certainly, but the music would never have existed without the collaboration of the prisoners—and guards—of Stalag VIIIA. Rischin lovingly brings to life the other musicians—Étienne Pasquier, cellist; Henri Akoka, clarinettist; and Jean Le Boulaire, violinist—who played with Messiaen, the pianist at the première. You can sense something of their personalities in the instrumental parts of the Quartet. Pasquier was a wry, gentle man who might have had a major solo career if he had desired one. Akoka, as vibrant and unpredictable as the Quartet’s long clarinet solo, “Abyss of the Birds,” was an Algerian-born Jew who survived the war through blind luck and mad courage. He tried several times to escape, and, in April, 1941, he succeeded: while being transferred from one camp to another by train, he jumped from the top of a fast-moving cattle car, with his clarinet under his arm. Le Boulaire, moody and withdrawn, later abandoned the violin for acting. He took the name Jean Lanier and appeared in New Wave films such as “The Soft Skin” and “Last Year at Marienbad.” When Rischin interviewed him, she perceived him to be a bitter, unhappy man, but at the mention of Messiaen’s Quartet his eyes brightened. “It’s a jewel that’s mine and that will never belong to anyone else,” he said. Then, there was the quasi-angelic figure of Karl-Albert Brüll, a music-loving guard at Stalag VIIIA. Excited by the presence of a significant composer, Brüll gave Messiaen pencils, erasers, and music paper, and had the composer stationed in an empty barrack so that he could work undisturbed. A guard stood at the door to turn away intruders. After the première, Brüll arranged for Messiaen’s rapid return to France, conspiring in the forging of documents. A German patriot with anti-Nazi tendencies, he kept a sympathetic watch over Jewish prisoners, repeatedly advising them not to try to escape, because they would be safer in Stalag VIIIA than in Vichy France. Several decades later, Brüll came to Paris and rang at Messiaen’s door. For reasons that remain obscure, Messiaen declined to see him. Perhaps he didn’t remember who Brüll was; perhaps he was unable to confront this apparition from the past. He eventually tried to correct his mistake, and sent a message to the man who had made his masterpiece possible. But it was too late: Brüll had died, after being run over by a car. "There shall be time no longer.” How did Messiaen understand this eerie phrase? First, it had for him a precise musical meaning. By 1941, this composer no longer wanted to hear time being beaten out by a drum—one, two, three, four; he had had enough of that in the war. Instead, he devised rhythms that expanded, contracted, stopped in their tracks, and rolled back in symmetrical patterns. Such music is heavenly to analyze but devilishly difficult to play. The Met Chamber Ensemble—Nick Eanet, violinist; Rafael Figueroa, cellist; Ricardo Morales, clarinettist; and, in a guest appearance, the veteran new-music pianist Christopher Oldfather—worked at the highest level. What they lacked was the total unanimity that makes a great performance of the Quartet seem like a mind-reading séance. (The group Tashi achieved this in an as yet unsurpassed recording, on the RCA label.) Still, the Met musicians were a joy to hear, not only in the Messiaen but also in pieces by Mozart, Debussy, Webern, and Berg, with James Levine joining in on piano. For Messiaen, the end of time also meant an escape from history, a leap into an invisible paradise. Hence the hypnotically simple E-major chords in the two “Louanges.” The postwar avant-garde composers who studied with Messiaen—Boulez, Stockhausen, Xenakis—wanted to eradicate all traces of the old world, but their teacher was not afraid to look back. In fact, Messiaen based the “Louanges” on two of his prewar compositions—“Oraison,” from a piece titled “Fête des belles eaux,” for six Ondes Martenot, one of the first electronic instruments; and “Diptyque,” a 1930 piece for organ. The scholar Nigel Simeone tells us that “Fête” was written for the Paris Exposition of 1937, one of whose attractions was a “festival of sound, water, and light.” Women in white flowing dresses played the Ondes in conjunction with spectacular fireworks and fountain displays. The opening phrase of the first “Louange” originally accompanied a colossal jet of water. It is disconcerting to associate the Quartet with Moulin Rouge-style production values. But Messiaen always took joy in skating between the mundane and the sublime. He loved God in terms that were sensual, almost sexual. Human love and divine love were not opposites, as they are for so many close readers of the Bible, but stages in an unbroken progression. One undulating phrase in the final “Louange” is marked “avec amour.” Eanet, the Met’s brilliant young concertmaster, played with the lonely ardor of a forgotten Paganini working in an empty café. This is the music of one who expects paradise not only in a single awesome hereafter but also in the happenstance epiphanies of daily life. In the end, Messiaen’s apocalypse has little to do with history and catastrophe; instead, it records the rebirth of an ordinary soul in the grip of extraordinary emotion. Which is why the Quartet is as overpowering now as it was on that frigid night in 1941. I write more about Messiaen in my book The Rest Is Noise. SPEW: The Gazebo of Ecstasy, Op. 132. Ernest Able conducting; Graeme Gower, baritone (Drumlanrig); Dorothy True, contralto (Hyacinth); Sylvia Bunting, soprano (Irmea); William Floss-Haines, countertenor (Sage); Amy Biggs, mezzo-soprano (Exquisite Nymph); Wolfgang Schrek, speaker (Jellyfish); Sussex Schools Boys' Choir; Sussex Downs Symphony Orchestra. MARCO POLO 3020 [AAD]; three discs: 63:10, 58:03, 34:23. For many decades the neglect of the late-nineteenth-century Manx composer Lionel Wainscotte Spew (1869-1917) has been a subject of pain for devotees of unsung music from the British Isles. With this release from Marco Polo, the situation has begun to be remedied. Spew lived most of his life on the Isle of Man, but attended Oxford briefly and afterwards worked in London as a copyist for Sir Arthur Sullivan. His early works showed the influence of Spohr, Czerny, and Raff; as he moved into his middle period, with such works as the Channel Symphony and the large-scale oratorio The Assumption, he began to establish an independent voice which should have won him a place beside such major lights of the era as Charles Hubert Parry. What a teeming wealth of music remains to be discovered: the six symphonies (among them the Sinfonia longa, whose score Sibelius once glanced at), the nine viola concertos (Spew was a great friend of violist Dorian Cathcart Trew, 1863-1921), the seven wonderful sonatas for horn and piano, surely among the finest of their kind written in Northern Europe in the latter half of the nineteenth century, hundreds of organ etudes (Spew was a gifted if eccentric organist), and a series of five music dramas, of which The Gazebo of Ecstasy is the first to be performed—excluding one disastrous production of Young Domitian at the Isle of Man Summer Opera Festival in 1916, a heartbreaking ordeal which forced a sharp and it turned out fatal decline in Spew's always faltering health. The plot of The Gazebo of Ecstasy might be summarized briefly in order to give the reader a picture of the slightly remote but nonetheless fascinating Edwardian atmosphere out of which the opera so vibrantly springs. The text is more or less of Spew's own composition; it is based upon an epic poem published in 1903 by the Irish poet James O'Flaherty Flanagan, who was a follower of William Butler Yeats in the nineties literary movement known as the "Celtic Twilight." The Gazebo of the title is a small structure on the cliffs of the northern side of the Isle of Man, known for centuries to be inhabited by the ghost of Drumlanrig, who visits the hut as a respite from his restless wanderings across the Irish Sea in search of the maiden Irmea, who threw herself off the cliff sometime in the late Iron Age for reasons that neither the poem nor the opera ever makes entirely clear. Drumlanrig speaks his woe aloud to the waves as the opera opens; he is overheard by Hyacinth, a thirteen-year-old boy who is alone in a neighboring cottage, accidentally left there by his vacationing parents. Hyacinth and Drumlanrig swear eternal friendship and together go in search of the Amulet of Ecstasy, which will, it is said, restore Irmea to life. They journey far and wide, enter a land of ancient dwarves, and meet a fiery Sage who duly informs them that the Amulet in fact is hidden beneath the Gazebo (hence the title). When the Amulet is finally held aloft, Irmea rises from the waves, greets Drumlanrig with joy, but then sees Hyacinth playing his flute in the Gazebo, falls madly in love with him, and in a strange homicidal fit drags the boy back into the sea with her. Drumlanrig resumes his restless wanderings as the curtain falls. In a startling half-hour epilogue to the opera Spew asks the orchestra to execute a wearingly repetitive series of astringent quarter-tone effects; otherwise the opera is written very much in the conservative idiom of the era, with hints here and there of Spew's late masterpieces still to come (his final opera, Gladstone, and the Sinfonia galactica). Irmea's aria to Hyacinth is surely one of the heights of British musical pastoralism, and the harrowing descent into the waves that follows (a huge downward chromatic scale from the top to the bottom of the orchestra, largissimo) is, well, harrowing. Marco Polo has put us forever in their debt by gathering forces for this production, although here and there one must have complaints. The singing of Dororthy True (no relation to the violist) as Hyacinth misses a little of the pure innocence one might desire for this role. Graeme Gower as Drumlanrig is very pleasing indeed, with a faintly sinister baritone that proves illuminating in a role which might otherwise be played with too much pure innocence. Dame Sylvia Bunting, as Irmea, brings back memories of her greatest days. The singing of the Sussex Schools Boys' Choir, as the Waves, is occasionally a bit rough around the edges but nonetheless is highly evocative. The Sussex Downs Symphony Orchestra lacks a finish to their sound that one might expect, say, from the Chicago Symphony Orchestra, which would be the ideal Spew ensemble, but they play with much spirit and enthusiasm. The conductor is Ernest Able, and one might see that he is both earnest and able, no pun intended. A minor complaint about the notes: the annotator twice misspells the name of Spew's friend True as "Trew." Recommended with the utmost possible enthusiasm. The New Yorker, April 19, 2004. Fleisher is seventy-five, but he looks an eternal, grizzled, professorial sixty. He is one of the incorruptible legends of his profession; some time ago, students took to calling him the “Obi-Wan Kenobi of the piano.” Working with him on the Schubert sonata was Inon Barnatan, a twenty-five-year-old Israeli pianist with a clean-cut look. Barnatan smiled nervously and looked at the keyboard. How do you make notes sound like ten-billion-year-old stars? He tried again. He had been playing with exceptional stylishness; he obtained a hypnotic tone from the piano. But in his hands the Andante felt a little too finished, too smooth; the main theme didn’t sing out enough against the accompaniment, which consists only of C-sharps slowly rising by octaves. Playing the same sonata hundreds of times in public is something that Leon Fleisher never got to do. In the nineteen-fifties, he was hailed, along with William Kapell, as one of the most brilliant American pianists of his generation; he made near-definitive recordings of the Brahms concertos with George Szell and the Cleveland Orchestra. Then, in 1964, while preparing for a tour of the Soviet Union, he found that the fourth and fifth fingers of his right hand were involuntarily curling up. He gritted his teeth and practiced harder. Within a few months, his right hand was almost useless. He was suffering, although he did not know it at the time, from a neurological condition known as dystonia, which is a kind of short circuit between the fingers and the brain. Only in the past few years, after receiving Botox injections in his hand, which relaxed his muscles, has he been able to play again at full strength. Fleisher recently told his life story at a presentation sponsored by the Dystonia Medical Research Foundation, in New York. Not one to sentimentalize, he began by saying, “It’s a pretty good soap opera.” Nonetheless, he confessed that the loss of his right hand had nearly broken his spirit. What saved him was the realization that he loved music more than he loved the piano. He took up pieces written for the left hand alone, he learned conducting, and, above all, he taught. His reputation as a sage of the piano crystallized at this time. By his own account, he could no longer push his students off the bench in order to demonstrate how a passage should go; instead, he had to use words. He had the advantage of having studied in the nineteen-forties with Artur Schnabel, who was perhaps the sagest pianist of the century—a poet of the instrument, a scholar of the repertory, a master of language. Many of Fleisher’s ideas about articulating rhythm, melody, and harmony come straight from his memories of Schnabel’s classes, which took place in a famously over-upholstered apartment on Central Park West. Fleisher’s references were sometimes arcane, as when he alluded to the “Toonerville Trolley” comic strip, which stopped running in 1955, or when he asked one student playing a meditative passage for “a chakra point below the navel.” Even his most fanciful images, however, had a precise application. Yuja Wang, a dynamic player who was tackling Schubert’s C-Minor Sonata, was too brutal in her attack. The piece has violence in it, Fleisher told her, but not of a modern kind. “Back in 1828, when this was written, people fought duels, and before they took out their swords they looked each other in the eye,” he said. “Now our killing is long-distance. Bombs travel hundreds of miles. They explode. So what? I want a different intensity.” Fleisher grabbed Wang’s arm and showed how she was “dive-bombing” the keyboard from above. He asked for a more lateral motion. “Play forward and upward,” he said, echoing a favorite phrase of Schnabel’s. The transformation was instantaneous: in place of chords that crunch on impact, Wang got sounds that sang out after the initial zing. Fleisher’s demands can be gruelling, but the results in this case were dramatic. On March 31st, in a collective concert at Carnegie’s Weill Hall, four pianists—Barnatan, Wang, Hiroko Sasaki, and Mana Tokuno—demonstrated what they had learned from some fifty hours of instruction. Wang’s performance was the most immediately gripping. She had total command of the sometimes sadistically difficult C-Minor Sonata, and she conveyed a kind of joy in the challenge of it. Early on in the piece, she had trouble negotiating simpler, more songful passages, and by the end she still had not fully grasped the slow movement: the central, heart-stopping modulation from A minor to A-flat major went by as if nothing special had happened. But the second theme of the first movement, which she had initially pronounced “plain,” glowed with life. Barnatan was the most naturally poetic of the four pianists; he has an instinctive understanding of Schubert’s fragile, deep world. Sometimes he got lost in the sounds he was creating; in the first movement, he kept losing track of the pulse and speeding up when he got loud. But in the Andante he made sounds that might have won the approval of Schnabel himself. Several times, he let his eyes drift penitentially toward the rafters, so that if you had been looking straight at him you would have seen only the whites of his eyes. The New Yorker, December 22 and 29, 2003. Early in “The Fellowship of the Ring,” the first film in Peter Jackson’s monumental “Lord of the Rings” trilogy, the wizard Gandalf finds himself alone in a room with the trinket that could end the world. It lies gleaming on the floor, and Gandalf regards it with an attitude of fascinated fear. The audience feels a chill that neither Jackson’s vertiginous camera angles nor Ian McKellen’s arching eyebrows can fully explain. The Ring of Power extends its grip through the medium of music, which is the work of the gifted film composer Howard Shore. In the preceding scenes, an overview of the habits of hobbits, Shore’s music had an English-pastoral, dance-around-the-Maypole air, but when the ring begins to do its work a Wagnerian tinge creeps in—fittingly, since “The Lord of the Rings” dwells in the shadow of Wagner’s even more monumental “Ring of the Nibelung.” J. R. R. Tolkien’s fans have long maintained a certain conspiracy of silence concerning Wagner, but there is no point in denying his influence, not when characters deliver lines like “Ride to ruin and the world’s ending!”—Brünnhilde condensed to seven words. The minor triad would not in itself be enough to suggest something as richly sinister as the Ring of Power. Here Wagner comes in handy. He famously abandoned the neat structures of classical harmony for brooding, meandering strings of chords. In the “Ring,” special importance attaches to the pairing of two minor triads separated by four half-steps—say, E minor and C minor. Conventional musical grammar says that these chords should keep their distance, but they make an eerie couple, having one note (G) in common. Wagner uses them to represent, among other things, the Tarnhelm, the ring’s companion device, which allows its user to assume any form. Tolkien’s ring, likewise, makes its bearer disappear, and Shore leans on those same spooky chords to suggest the shape-shifting process. In “The Return of the King,” which opens this week, Shore’s music keeps pace with the burgeoning grandeur of the filmmaking. When the hobbits escape Mt. Doom, Renée Fleming sings, in Elvish. As the evil lord Sauron comes to grief, the dusky harmonies of the ring give way to their mirror image in the major key. There is an abrupt harmonic shift that has the effect of sun breaking through clouds. You would have thought that sometime between the birth of Stravinsky and the publication of “Alexander’s Ragtime Band” such echt-Wagnerian material would have gone out of fashion, but there is life in the fat lady yet. Tolkien refused to admit that his ring had anything to do with Wagner’s. “Both rings were round, and there the resemblance ceased,” he said. But he certainly knew his Wagner, and made an informal study of “Die Walküre” not long before writing the novels. The idea of the omnipotent ring must have come directly from Wagner; nothing quite like it appears in the old sagas. True, the Volsunga Saga features a ring from a cursed hoard, but it possesses no executive powers. In the “Nibelungenlied” saga, there is a magic rod that could be used to rule all, but it just sits around. Wagner combined these two objects into the awful amulet that is forged by Alberich from the gold of the Rhine. When Wotan steals the ring for his own godly purposes, Alberich places a curse upon it, and in so doing he speaks of “the lord of the ring as the slave of the ring.” Such details make it hard to believe Tolkien’s disavowals. Admit it, J.R.R., you used to run around brandishing a walking stick and singing “Nothung! Nothung!” like every other besotted Oxford lad. It is surely no accident that the notion of a Ring of Power surfaced in the late nineteenth century, when technologies of mass destruction were appearing on the horizon. Pre-modern storytellers had no frame of reference for such things. Power, for them, was not a baton that could be passed from one person to another; those with power were born with power, and those without, without. By Wagner’s time, it was clear that a marginal individual would soon be able to unleash terror with the flick of a wrist. Oscar Wilde issued a memorable prediction of the war of the future: “A chemist on each side will approach the frontier with a bottle.” Nor did the ring have to be understood only in terms of military science. Mass media now allowed for the worldwide destruction of an idea, a reputation, a belief system, a culture. In a hundred ways, men were forging things over which they had no control, and which ended up controlling them. Tolkien began “The Lord of the Rings” in the wake of the First World War, whose carnage he experienced firsthand, and he finished it in the wake of the Second. In both wars, he witnessed the wedding of Teutonic mythology to German military might. He bemoaned how the Nazis had corrupted “that noble northern spirit.” You could see “The Lord of the Rings” as a kind of rescue operation, saving the Nordic myths from misuse—perhaps even saving Wagner from himself. Tolkien tried, it seems, to create a kinder, gentler “Ring,” a mythology without malice. The “world-redeeming deed,” in Wagner’s phrase, is done by the little hobbits, who have no territorial demands to make in Middle-earth and wish simply to resume their gardening. In the end, the elves give up their dominion, just as, in Wagner, the gods surrender theirs. Yet it is a peaceful transfer of power, not an apocalyptic one. The story ends not with the collapse of Valhalla but with the restoration of a wasted world. It is probably heretical to suggest that the “Lord of the Rings” films surpass the books on which they are based. (Correspondence on this subject may be addressed to Alex Ross, The North Pole.) The books tell a fantastic story in a familiar style, but the movies transcend the apparent limitations of their medium in the same way that Wagner transcended the limitations of opera. They revive the art of Romantic wonder; they manufacture the sublime. I hope that at least a small fraction of the huge worldwide audiences for these films will one day be tempted into Wagner’s world, which offers something else again. For Tolkien, myth is a window on an ideal world, both brighter and blacker than our own. For Wagner, it is a magnifying mirror for the average, desperate modern soul. There is a widespread conception of Wagner’s cycle as a bombastic nationalistic saga in which blond-haired heroes triumph over dwarfish, vaguely Jewish enemies. Wagner unquestionably left himself open to this interpretation, but the “Ring” is not at all what it seems. It is in fact a prolonged assault on the very idea of worldly power, the cult of the monumental—everything that we think of as “Wagnerian.” At the beginning, the god Wotan is looking to expand his realm. But every step he takes to assert himself over the affairs of others, to make his will reality, leads inexorably to his downfall. He is marked from the outset, and the ring becomes a symbol of the corruption of his authority. Tolkien believes in the forces of good, in might for right. Wagner dismisses all that—he had an anarchist streak early on—and sees redemption only in love. When Tolkien stole Wagner’s ring, he discarded its most significant property—that it can be forged only by one who has forsworn love. (Presumably, Sauron gave up carnal pleasures when he became an all-seeing eye at the top of a tower, but it’s hard to say for certain. Maybe he gets a kick out of the all-seeing bit.) The sexual opacity of Tolkien’s saga has often been noted, and the films faithfully replicate it. Desirable people appear onscreen, and one is given to understand that at some point they have had or will have had relations, but their entanglements are incidental to the plot. It is the little ring that brings out the lust in men and in hobbits. And what, honestly, do people want in it? Are they envious of Sauron’s bling-bling life style up on top of Barad-dûr? Tolkien mutes the romance of medieval stories and puts us out in self-abnegating, Anglican-modernist, T. S. Eliot territory. The ring is a never-ending nightmare to which people are drawn for no obvious reason. It generates lust and yet gives no satisfaction. Wagner, by contrast, uses the ring to shine a light on various intense, confused, all-too-human relationships. Alberich forges the ring only after the Rhine maidens turn away his advances. Wotan becomes obsessed with it as a consequence of his loveless marriage; he buries himself in his work. Even after he sees through his delusions, and achieves a quasi-Buddhist acceptance of his powerlessness, he has nothing else to lean on, not even his Gandalfian staff, and wanders off into the night. Siegfried and Brünnhilde, lost in their love for each other, succeed in remaking the ring as an ordinary trinket, a symbol of their devotion. They assert their earthbound passion against Wotan’s godly world, and thus bring it down. The apparatus of myth itself—the belief in higher and lower powers, hierarchies, orders—crumbles with the walls of Valhalla. Perhaps what angered Tolkien most was that Wagner wrote a sixteen-hour mythic opera and then, at the end, blew up the foundations of myth. Admittedly, the notion of the “Ring” cycle as some sort of sexual hothouse can seem far-fetched when the operas are seen in performance. People like to think of Wagner as a lot of large people standing around and singing loudly, and they are not mistaken. The Met lacks a Heldentenor who looks even a little bit like Viggo Mortensen. But if in the opera house you sometimes notice a discrepancy between what you hear in the libretto and music and what you see onstage it is no less distracting than what moviegoers are asked to believe on a routine basis. You don’t ask whether an elf could kill an oliphaunt, or even what an oliphaunt is; you go along with the premise. It is the same in opera. The premise is that performers trained as opera singers are going to assume action-hero roles. Squint a little and it’s all fine. The experience of film—and, in particular, of music in film—has probably had a prejudicial effect on the way people view live opera. They expect images to set the tone and music to match—“Mickey-Mousing,” Walt Disney’s composers called it. Howard Shore, in “The Lord of the Rings,” practices the art of Mickey-Mousing at an exalted level. But in opera the music takes the lead, generating an imaginary landscape that directors and performers struggle to realize however they can. Not even Peter Jackson would be able to keep pace with Wagner’s hurtling, hovering, ever-evolving musical images, although someday an opera house is certain to ask him to try. When I see the cycle at the Met next spring, I will close my eyes from time to time and imagine movie and opera fused—as the one “Ring” to rule them all.